A language game that covers general language tasks, based around themes. 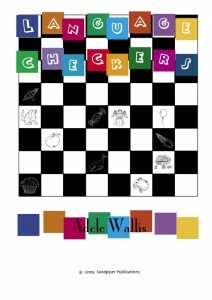 Checker boards have pictures of various objects based on several semantic themes. A cube net for a dice is also provided for each theme board that shows different questions or language tasks. Children play the game by moving a counter diagonally across the board, one space at a time (as you would in a normal game of checkers) then throwing the dice. The child then answers the question based on the picture they have moved on to. Twelve game boards are presented in A4 format. The game dice are presented as nets (2D plan) and are easily constructed. Great for home follow-up support.